Batley captain Tariq Hussain cuts the ball away during Saturday's game against Pudsey Congs. Woodlands inflicted a first defeat of the season on Pudsey St Lawrence in the Allrounder Bradford Premier League last Saturday. Batting proved difficult on the newly laid square at Tofts Road as the St Lawrence batsmen found the going tough as they slumped to 48-8 after electing to bat first. Left-armer Muhammad Bilal (3-14), spinner Chris Brice (3-15) and paceman Elliot Richardson (3-41) enjoyed themselves as they made the Saints struggle. Charlie Best was the only one of the first eight batsmen to make double figures and the eventual total of 93 was only achieved due to the efforts of tail-enders Charlie Parker (20) and Steve Watts (14). Sam Frankland (30) gave Woodlands a bright start before spinners Chris Marsden (3-19) and Archie Scott (2-18) sparked a collapse which saw five wickets fall for seven runs. Woodlands looked in trouble at 48-5, but young Jack McGahan soon steadied their nerves with an unbeaten 38 in an unbroken sixth-wicket stand of 50 with wicketkeeper Greg Finn (14no). 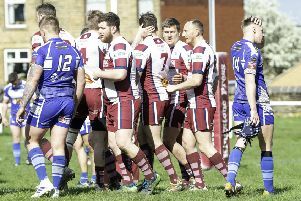 It was Woodlands’ second win of the season, which saw them close to within four points of St Lawrence and with Methley and Farsley also suffering defeats, champions Hanging Heaton are now the only unbeaten team. Half-centuries from opener Nick Connolly (84) and Callum Geldart (54) enabled Hanging Heaton to build a match-winning total of 263 against Townville. Connolly hit eight fours an two sixes in a 102 ball innings, while Geldart struck four fours and two sixes before big hitting David Stiff boosted the total with 32 from just 24 balls. Conor Harvey was pick of the Townville bowlers with 5-46 and followed up by scoring 54. Harvey and Jonny Booth (32) shared an opening wicket stand of 76 but Heaton fought back as Chris Goodair removed both openers, while Stiff claimed 3-57. Richie Bresnan (51no) weighed in with late runs which at least earned his side maximum batting points as Townville closed on 227-9 but Heaton have moved 12 points clear at the top.